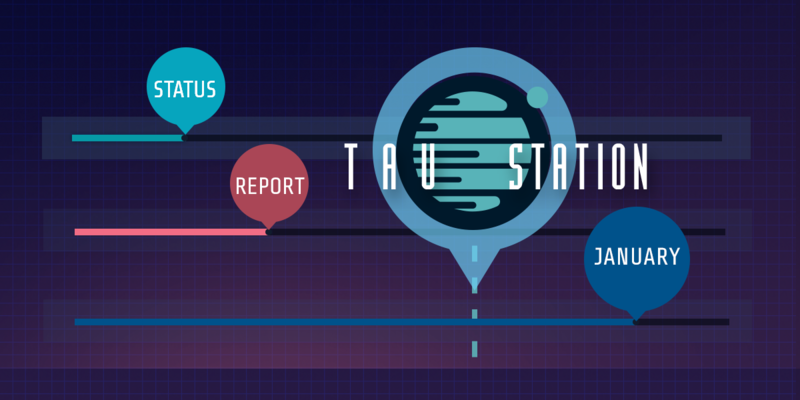 The status reports contain major aspects of the work done on Tau Station during the according month. As we’ve started to provide changelogs for every game update, you can find more details, including also all smaller changes, in these dedicated posts. Links to all updates/changelogs that happened this month are listed up at the bottom of this article. Confinement – The first three times you’re confined, you’ll have lower times to stay at the Brig, including an explanation for new adventurers. Items – Many balancing updates to items and prices. VIP packages – Can now be acquired from vendors. Discreet Work – Item re-balancing to prevent farming and imbalance to other tasks. Career – Task success rate now takes into account how “strong” the stat used is. Rations – You can now bribe guards in the Government Center for extra rations. Game Start – A welcome screen for new players provides first starting tips. Area – Art for Consortium Embassy. Game start – Design work done for character creation page. Chat – More work on designing a chat interface. Avatars – Started designing avatars for your characters. Area – Created updated art for residences. Inventory – Continued work on it, along with primary and secondary weapon slots. Chat – Much work done on improving behavior of the chat system (e.g. scrolling). Express shuttles – Now showing level of destination, similar to regular shuttles. Bank – Added bond-to-credit conversion. Accessibility – Continued work to ensure store is accessible. Missions – Ensured missions only have dialog prior to the “Accept” step. Messaging – Prefilled subject lines for email, blog, and forum replies. Deployments – Switching over to a “live” deployment process. Backup – Tested production database backups. Logging – Fixed broken logging (oops). New mission – “Fashion Victim,” available on Tau Station. Missions – Many fixes due to tester feedback (thanks!). Archive – Rewrites to remove out-of-date information. Career – Reworked career tasks so it’s more clear which tasks are illegal or dangerous. Missions – Continue filling out the stations with additional missions. Market – Unlocking “Electronic Market” feature for player-to-player trading. Character creation – A new page for game start, along with the ability to select genotype. Tutorial – Create mini-tutorial mission. Ruins – “Campaigns” feature to clean out bandits. Stats – Show “time to refill” for stats. UI – Several UI refinements. Chat – Plans to implement 1:1 private chats feature. “Report and issue” button to make it easier for you to provide feedback. Game feedback – Better feedback for mission rewards and leveling up. New System – Started planning the opening of the Barnard’s Star system. There are 19,009 potential different paths one can can take to complete the 129-step long “Stealing from Ghosts” mission on The Ghost of Mali in the Alpha Centauri system. We have missions with fewer steps and more than one million potential paths. It turns out that it’s hard to validate missions which are this complicated! You can find a short detail summary of every single update in the according changelog we have been publishing on an a regular basis since we started the Closed Alpha Test. Here are all changelogs of this month.